As you can see the price of computers has dropped drastically over the years. From 1999 to 2003 the index dropped over 20% every year. Lately the rate of price drop has slowed but the prices for computers are still dropping. The index has decreased at a rate of 11-12% annually for the last 3 years. Remember this is an index of prices so its not directly related to a specific dollar amount for a specific item. They are looking at personal computers and peripheral equipment prices as a whole so its a combination of everything in that category: very expensive computers, cheap computers, monitors, printers, etc. So while the overall prices may have gone down from a 700 level to 100 level that doesn't mean that any individual computer part you buy today will cost 1/7th of what it cost 10 years ago. For example the cheapest Dell system today costs about $400 but the cheapest Dell 10 years ago was not 7 times that much. Overall this kind of price trend does matches reality pretty well. I remember in the late 1980's that an IBM PC would cost in the ballpark of $3000. I remember spending about $1500 for my first real PC back around 1994. Today you can buy a decent Dell system for around $400. A printer today can be bought for as little as $25-$50 on sale but 10 years ago they'd easily run $150-$200 minimum. 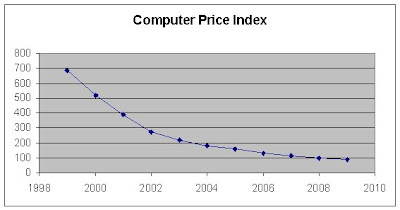 From the index and from direct observation, its clear that personal computer prices have been steadily decreasing over the past decade.